Dr. Stencel writes, "Studies of the long-term, out-of-eclipse photometry of the enigmatic binary, epsilon Aurigae, suggest that intervals of coherent pulsation occur at roughly 1/3 of the 27.1-year orbital period. Kloppenborg, et al. (2012 JAAVSO 40, 647 = http://adsabs.harvard.edu/abs/2012JAVSO..40..647K) noted that 'stable variation patterns develop at 3,200-day intervals' implying that 'the next span of dates when such events might happen are circa JD ~2457000 (2014 December)'. "These out-of-eclipse light variations often have amplitudes of ~0.1 magnitude in U, and ~0.05 in V, with characteristic timescales of 60–100 days. The AAVSO light curve data to the present may indicate that this coherent phenomenon has begun, but we encourage renewed efforts by observers during this coming autumn and winter timeframe. Additional data can help deduce whether these events are internal to the F star, or externally-driven by tidal interaction with the companion star." Please monitor eps Aur beginning now. Because of the very small amplitude of the expected variations, CCD, DSLR, or PEP photometry will be more successful than visual observations in detecting the pulsations. Nightly observations or one observation every few days is sufficient; time series are not necessary. Use of a V filter is strongly recommended; U observations would also be very valuable, as would coverage in B and R.
Charts for eps Aurigae may be created using the AAVSO Variable Star Plotter (VSP, http://www.aavso.org/VSP). Please report your observations to the AAVSO International Database using the name EPS AUR. Eps Aur was the subject of major international campaigns and the AAVSO's Citizen Sky project as it went through its 27.1-year eclipse in 2009-2011. Over 700 observers worldwide submitted over 20,000 multicolor observations to the AAVSO International Database for this project. 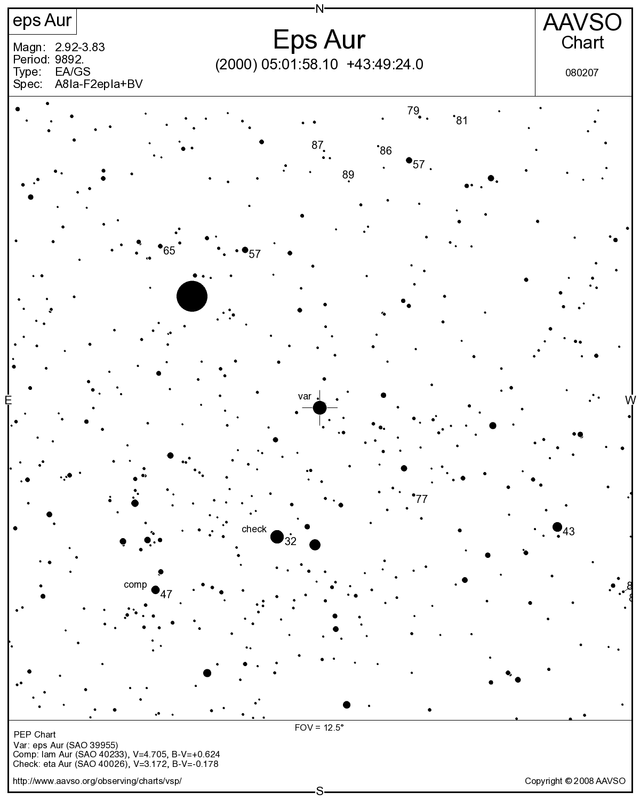 Information on eps Aur from the AAVSO includes material on the Citizen Sky website (http://www.aavso.org/epsilon-aurigae and http://www.citizensky.org/content/star-our-project), the Variable Star of the Season on eps Aur (http://www.aavso.org/vsots_epsaur), AAVSO Alert Notices 398 and 410, and AAVSO Special Notice #246. Volume 40, Number 2 of the Journal of the AAVSO (2012, 516 pages; http://www.aavso.org/jaavso-v40n2) was devoted to discussion of and research results from this event. This AAVSO Alert Notice was compiled by Elizabeth O. Waagen and includes material from Dr. Stencel and Dr. Matthew Templeton (AAVSO).